President Barack Obama, Ruby Bridges Hall, Norman Rockwell Museum Director Laurie Norton Moffatt, and Museum President Anne Morgan, view Norman Rockwell’s “The Problem We All Live With,” hanging in a West Wing hallway near the Oval Office, July 15, 2011. Official White House Photo by Pete Souza. Courtesy The White House. All rights reserved. President Barack Obama opened the doors of the White House today, July 15, 2011, for a special meet and greet with Norman Rockwell Museum Director/CEO Laurie Norton Moffatt; Museum President Anne Morgan; and Museum Trustee Ruby Bridges Hall. The meeting was held to celebrate the White House exhibit of Norman Rockwell’s classic 1963 painting The Problem We All Live With, which was inspired by Bridges’ history-changing walk integrating William Frantz Public School in New Orleans on November 14, 1960. 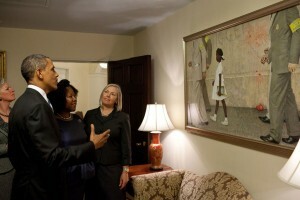 President Obama requested the loaning of the painting from the permanent collection of Norman Rockwell Museum to honor the 50th anniversary of Bridges’ childhood experience. 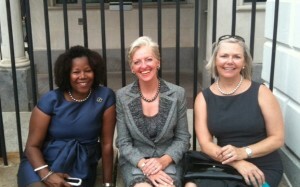 From left to right: Norman Rockwell Museum Trustee Ruby Bridges Hall, President Anne Morgan, and Director/CEO Laurie Norton Moffatt, wait outside the west entrance of the White House to meet with President Barack Obama. Photo ©Norman Rockwell Museum. All rights reserved. During the afternoon meeting, the President showed his guests an original copy of The Emancipation Proclamation signed by President Abraham Lincoln, hanging in the Oval Office over a bronze bust of Dr. Martin Luther King, Jr. In the same room, the group viewed Rockwell’s original painting of the Statue of Liberty, painted for the July 6, 1946 cover of The Saturday Evening Post, and donated to the White House in 1994 by film director Steven Spielberg, who also serves on the Museum’s Board of Trustees.